OfficeFurnitureSpot.com is thrilled to announce that they will offer free shipping and no sales tax on all orders placed outside of Colorado and Florida until April 15th. Make tax season easier on your wallet and your mind by purchasing discount office furniture with free shipping in the continental United States, no sales tax and the security and convenience of ordering online. Customers can find great prices on many name brand office furniture sets like the Cambridge 5 Piece Desk Set by Legends shown here. In this tough economy, and especially during tax time, we’re pleased to offer home office seating and executive desks that set the tone you want without setting back your budget. Nearly three-quarters of the American public finds dealing with money matters stressful, according to a survey done by the American Psychological Association. This stress becomes even more intense during tax time. OfficeFurnitureSpot.com looks to help ease that pressure by offering free shipping anywhere in the continental United States along with no sales charge for orders placed outside of Colorado and Florida until April 15th. 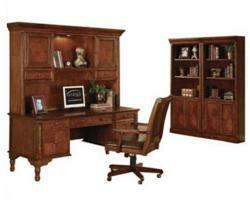 OfficeFurnitureSpot.com features top brands of quality, ready-to-assemble discount office furniture backed up by secure Verisign ordering and a low price guarantee. Their website also provides expert product advice to help you furnish your home office, as well as dedicated customer service to ensure that the purchasing process is as painless as possible. About OfficeFurnitureSpot.com: OfficeFurnitureSpot.com is a division of InteriorMark, LLC, a leading retailer of bedroom furniture, entertainment furniture home theater furniture products, massage chairs, sofas and sectionals. They offer a variety of products and services intended to help consumers design and enjoy the living room space or home theater most suited to their budget and tastes. InteriorMark is a member of the National Home Furnishing Association, and a proud member of the Better Business Bureau. 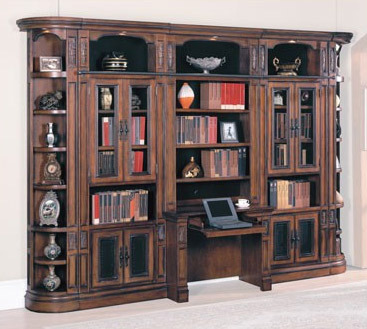 Many luxury office items, like the 6 Piece DaVinci Library Wall by Parker House shown here, are available from OfficeFurnitureSpot.com with free shipping. Office Furniture Spot offers great prices and free shipping on cutting edge modern designs like the Modloft Pearl MD105-WAL Bookcase shown here. 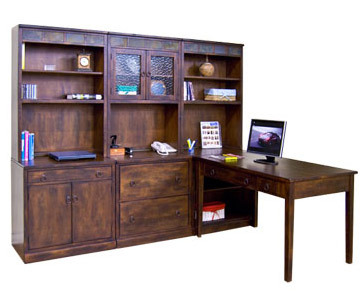 Many items, like the Sunny Designs Santa Fe Desk and Hutrch set seen here, qualify for free shipping and no sales tax in the continental USA.